Cronin’s Yard accesses two National Looped Walks, the Cronin’s Yard Loop and the Lisliebane Loop. 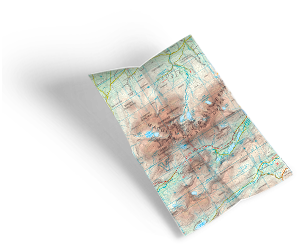 Information and downloadable maps (courtesy of Fáílte Ireland) are available here. Loop 114. Cronin’s Yard Loop. Terrain: Sandy paths and mountain tracks. Min. Gear: Hiking boots, raingear, fluid, snack and mobile phone. A-B: Starting from the trailhead at the exit from Cronin’s Yard follow the purple arrow along the sandy path for 1km to reach a footbridge over the Caol River. Shortly afterwards you reach a Y-junction above a second footbridge. This is the point from where the loop ‘proper’ begins – you will return to here later – for now veer left. 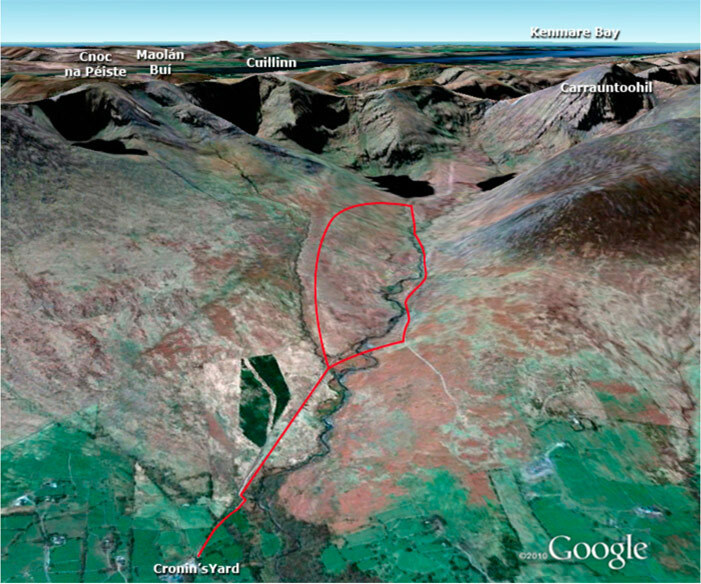 B-C: Follow the purple arrows across a stile and onto the left bank of the Gaddach River. After 500m you reach a clump of trees where the loop turns sharp left off the river, and crosses a short section of open ground to join the right bank of the Caol River. Follow the river uphill for 500m – but watch carefully for a point where the loop veers right, crosses over a ridge, and descends at an angle to reach a Y-junction in the Gaddach River. Joining the riverbank – turn left. C-D: Following the purple arrows along the riverbank for 500m you reach Lough Callee where the loop crosses to the other side of the river and joins a sandy path. Turn right here and start the descent toward the trailhead. After 500m cross a stream via stepping stones and, after 1km, you reach a Y-junction of paths. The path to the left is the route back to another trailhead at Lisleibane – you veer right (downhill) and cross the Gaddach River again at a metal footbridge. Almost immediately after the footbridge – you regain the point mentioned at B above from where you started the loop – this time veer left. D-A. Follow the sandy path as it takes you back across the footbridge over the Caol River and back to the trailhead.